The office market in San Diego is strengthening as companies expand to accommodate growing workforces. Total employment will increase 2.8 percent in 2015 as employers add 38,000 workers to payrolls. Over the past year, the largest advances were recorded in the professional and business services sector. The leisure and hospitality and the education and health sectors added more than 7,000 jobs each. 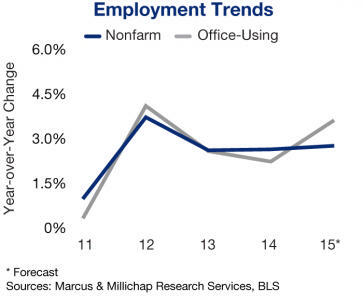 Employers using office space have outpaced overall hiring in the market. This year there will be 12,000 jobs added in the primary office-using sectors alone. Many companies are backfilling underutilized space, while others are looking for larger locations are looking to be part of live-work-play environment and are leasing available space. The growing interest in office space has caused vacancy to drop over 200 basis points in the Downtown submarket in the last year. However, the rate is still higher than the metro average. Rising tenant demand market wide is encouraging builders to undertake the lengthy permitting process to begin new endeavors. Developers are slated to raise office inventory 1.2 percent this year, or by 1.2 million square feet. Only about 40 percent of completions this year are pre-leased. Currently a 306,000-square-foot building, One La Jolla Center in University Towne Center is slated for delivery in the third quarter. In addition, large amounts of speculative space due for completion in 2015 will slow the decline of vacancy, which recorded a triple-digit basis-point improvement in the first quarter. The elevated demand for space in the metro will foster strong rent gains and boost revenues for property owners. Average asking rents will rise to 5.3 percent to $28.75 per square foot, slightly more than 4 percent above the pre-recession high. Investment activity in the San Diego office market is building as improving operations and stiffening competition in other Southern California metros lure buyers to the county. Listings remain limited which is driving up competition for available assets. Sales in the $1 million to $10 million range make up the majority of transactions, indicating a strong presence of high-net-worth individuals and small groups. Buyers seeking security are pursuing listings with tenants locked into long-term leases. Many of these deals fall into the sale-leaseback category as companies sell off real estate assets in order to free up capital for further expansion. Opportunistic buyers are searching for Class B properties in submarkets with low vacancy that can easily be repositioned to attract new tenants. These properties trade in the high-5 to low-6 percent area. For investments over $10 million, buyers showed a penchant for assets along the I-5 and I-15 corridors, as well as within central San Diego. On average, these properties trade with first-year yields in the mid-6 percent range, though cap rates vary from the mid-5 to low-7 percent areas, depending on location. Across the metro, activity in this price tranche fell slightly over the past 12 months ending in the first quarter, limited by a lack of listings rather than a drop in interested buyers. The rise in competition among investors has resulted in many assets receiving multiple offers at or near list price. Life companies, CMBS, banks and credit unions are all competing for business. 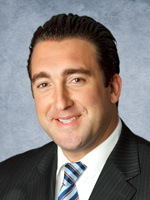 Vorsheck is first vice president and regional manager of Marcus & Millichap.